Tanmay Bhatt is a funny guy. Yes, his humour sometimes takes turns for the worst but the bottom-line is, the guy knows how to crack a joke. As it happens, he decided to crack one on Priyanka Chopra. When I say @priyankachopra's name in my head I now automatically pronounce it like "Priyaaaanka Chopruh"
Never one to sit back idly, Priyanka gave a fitting reply in the most hilarious way possible. And Tanmay joined her too…. But as is the norm now, he started getting hate for his tweet from legions of Priyanka Chopra fans. wo Lata didi wala lafda finished ? @thetanmay @priyankachopra Was that a joke? I mean do we need to laugh? 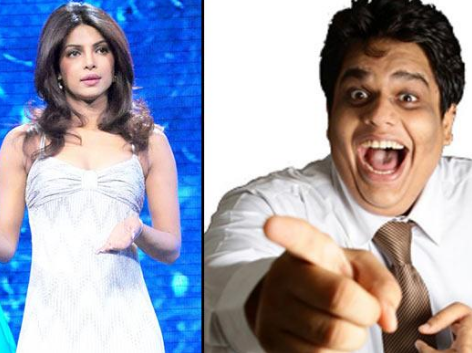 @thetanmay @priyankachopra and I picture a plastic bag. So much so, he had to actually tweet and ask them to stop. Even Piggy Chops had to intervene! What do they say about opening one’s mouth? Don’t!